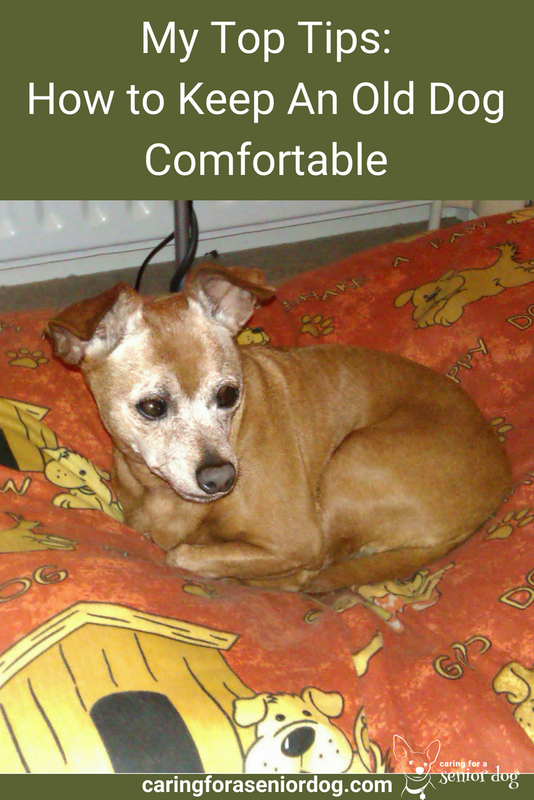 In this article we are going to be talking about how to make an old dog comfortable. You may have just welcomed a senior dog into your life and if you have, congratulations!! Or your dog has reached that golden age and you’re starting to wonder if there are things you could be doing differently. I have adopted a number of senior dogs over the years, so my tips and advice come from experience, tried by me and tested on all of them!! Red, the star of this article, this website, and the love of my life died a few weeks ago, but the information and tips you will find here are as relevant as ever! When my husband and I lived in Florida I volunteered in the “oldies room” at Tri County Humane Society, and that’s where I met Red. She is a Chihuahua/Min Pin mix, with a hint of Rhodesian Ridgeback! That’s right, there is that telltale ridge down her back, even though I can’t convince my husband of her lineage. Anyway, she was around 8 years old at the time, obese and blind but with the sweetest nature you’ll ever meet. What can I say, we fell in love with each other, and every Sunday when I went to volunteer she would jump around, so excited when she heard the sound of my voice. I would always walk her last so we could spend a long time cuddling outside. We brought her home, had her eyes fixed because they were literally about to pop out of her head, and put her on a weight loss program. She’s still blind but not in pain and looking good. Last month we celebrated 8 wonderful years together, and despite several issues she’s still going strong!! I absolutely must have animals sleeping in bed with him, otherwise it feels too empty. Yes my husband is there but let’s face it, it’s not the same. For the first few years Red slept tucked under my arm, and we would stay like that all night. When we adopted Saffy, a puppy mill rescue, she was so terrified she only found comfort with Red, so she left our bed to keep Saffy company. Later on after Saffy died and Red started having to pee more frequently, it was safer to have her sleep in her own bed, the floor covered in pee pads. Naturally her bed was on the floor right next to my side, how far away do you think I would let her go!! Three winters ago she discovered the joy of sleeping on a comforter (duvet to some! ), and now she has two to choose from. She loves the extra padding it gives her, and they’re light enough she can scrunch them into any configuration she likes. Although she wears a sweater for warmth in the winter, I always keep a blanket on her beds in case she gets cold. It’s too cute watching her wrap herself in one, like she’s in a cocoon. The type(s) of bed that suits your dog at one stage of life, may not suit at others so it will probably be a case of trial and error finding the next favourite. One thing I do look out for, especially if a dog has arthritis or some joint issues is, if you’re looking for a bed with raised sides so your dog can rest his head against it, be sure the front is low for ease of access. With age comes more frequent pee breaks, and with certain medications, even more! I take Red out quite often, and at night I cover the area where she sleeps with pee pads. The fact that Red is blind means I can’t just put a couple down and teach her to find them. Sometimes, no matter how many times they go out accidents still happen, and no matter how many pee pads you put down, they find the one tiny exposed spot!! Not much I can do but blot the stain and use a good cleaner. Many people have successfully used diapers, whether they are doggy diapers or those made for human babies. Sanitary pads can be put inside and suspenders attached to keep them up. They are available in washable and disposable versions. I don’t have any experience with them, but I know of many people who do and they’re very happy. I have had some wonderful vets over the years, and I’ve had the misfortune of meeting others who did not deserve the title. I am extremely fussy about the vet I choose, always have been, and even more so after several unfortunate and two deadly experiences. My current vet is a rock star whom I trust completely, and I don’t think Red would still be here if not for him. At one point I was also taking her to a holistic vet for acupuncture treatments, and supplements/herbal remedies that replaced drugs when possible. Because a small thing can become a big thing very quickly, particularly in old dogs, I go to the vet at the slightest change. I know Red extremely well so anything out of the ordinary, no matter how minor it may seem, merits a phone call for an appointment. The thing is – I’m never wrong when I suspect a problem. This to me is the most complicated topic of all. There is so much conflicting information, how do you know who or what to trust? Many vets believe in prescription diets, while others see no nutritional value. Raw food? Dehydrated? Freeze dried? Wet? Dry? Wheat free? Added omega 3s? Senior dog food because my dog is a senior? Yikes!! For many years Red was on a prescription diet, first for her heart, than her kidneys. My vet believes very strongly in the science behind them, and in their efficacy. To be honest, I too have seen first hand how much they have helped Red. Of course my holistic vet was not impressed and created a recipe for a home cooked whole foods diet, tailor made for her. Her meal consists of boiled chicken, cooked broccoli, brown rice, quinoa, raw apple, raw carrot and olive oil. I will say since she’s been on it she hasn’t had any diarrhea or eating issues. Update – We spent 4 months in Spain which is where we met the holistic vet. Although I kept Red on that diet for awhile, at one point her urea levels rose (which means kidneys), and my current vet believed it was because she was not eating her k/d…my holistic vet said it was a coincidence!! I compromised and fed her both!! The absolute best advice I can give you when it comes to deciding on what to feed your senior dog is to do your research. Learn about the various options available, including pros and cons. Speak to other dog parents to find out what they feed their pups, and involve your vet as well. Don’t forget, a lot of the time your dog’s health condition(s) will limit types of food he or she is able to eat. To get you started, here are a few links to some information I have found helpful. 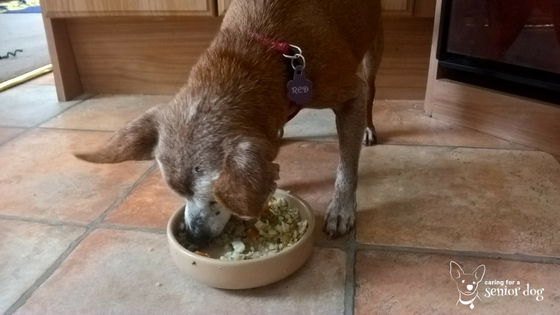 Read this ⇒ Prescription Diet Dog Food: The Lifesaver We’re Led to Believe? About a year and a half ago I raised Red’s food and water bowls off the floor. She didn’t look like she was having any trouble reaching her food (bless her she’s always had a healthy appetite! ), but I got this thought into my head that it might be more comfortable for her if they were elevated, and I do believe it is. You can find some beautiful adjustable bowls out there, but I went the DIY route and put the water bowl on top of an upside down glass casserole dish, and at meal time I hold the bowl for Red. As Red got older, the amount of medication she was on increased. It seemed like every time I went to the vet with a problem, I came out with more drugs. My holistic vet was shocked at the amount my little dog’s body was expected to process. Of course there are times when drugs are necessary, and I will without hesitation give her what’s necessary, but in many instances a homeopathic remedy or herbal supplement can do a good job, if not a great job. For about a year I was able to replace her heart medication with a supplement, which I was very happy about. 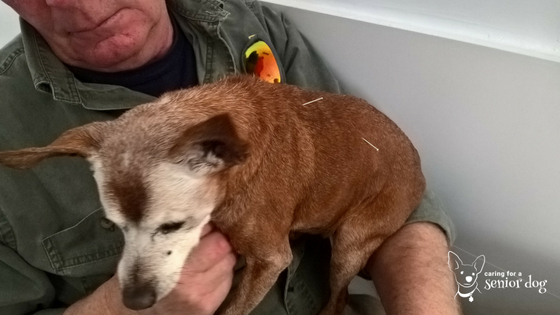 Red now also gets regular acupuncture treatments (both needles and laser), and I see how much it has helped boost her immune system. Good oral hygiene is critical for overall health, and yet Red makes it impossible for me to do a decent job, I should say any job! 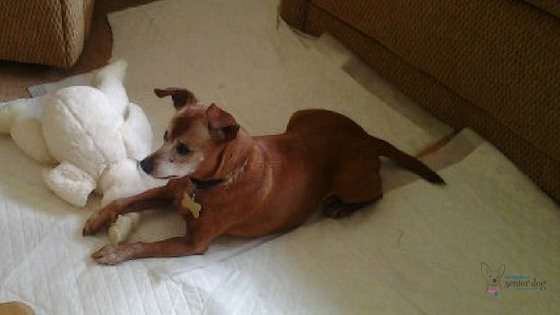 She weighs just under 10lbs, but when she clamps her jaws shut nothing is prying them apart. Even my vet needs back up! The thing is, if your dog has bad breath you know there’s a problem so I suggest you visit your vet sooner rather than later. 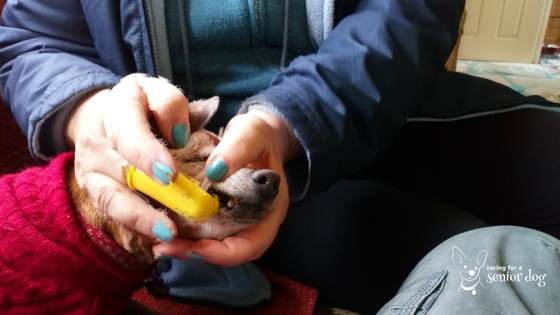 Your dog may be in pain (you know what a tooth ache feels like!! ), and really bad dental disease can lead to organ problems. Your vet will let you know what’s going on, and whether or not surgery is recommended. Discuss the risks and see if he can give your dog the mildest anesthetic available. It’s really good to know how many dental care products for dogs there are on the market, so no matter how difficult your dog is, there should be something you find that will work. I use a cotton pad wrapped around my finger with some dental gel on it, and while it’s still an epic battle it’s easier to get my finger in her mouth than a toothbrush. Since she gets so stressed I can only do it for a few seconds, but I feel it’s better than nothing. I also sprinkle Plaque Off powder onto her food. Other options are dental chews, bones, chew toys, water additives and the like. I try and go with the more natural products rather than chemical laden ones. I’ll be honest – I don’t like when people dress their dogs up like dolls. However I do believe in dogs wearing coats and sweaters for protection in the cold and rain. Red feels the cold more than she used to, and a Florida dog living in England definitely has to get used to some chillier weather. She wears a sweater indoors several months of the year, and a coat on top of that when she goes out in the really cold months. I bought a lot of her sweaters in WalMart, and I crocheted a few of her coats. Because of her size I can make one from scratch in an evening. I’ve included the video if you want to give it a try, and you don’t have to have any crocheting experience to do it!! Red’s fur doesn’t grow so all she needs are baths (which my husband does) and her nails clipped, which we have done at the groomer or vet’s office. No matter how old a dog is they still need to be groomed, but of course you have to be careful of painful joints which can make it hard for them to stand for long periods of time. Failing eyesight may make them nervous when they never used to be, and lumps and bumps mean greater care taken when shaving them. Having your dog groomed is also a good chance to check for any growths or changes that would otherwise go unnoticed. If you’ll be taking your dog to a new groomer and he does have some issues, be sure the groomer is comfortable with whatever is going on. We had a deaf and mostly blind dog and it was impossible for us to find one who felt comfortable grooming her. I ended up buying clippers and doing it myself while my husband fed her constant treats. Anti anxiety medication, for both of you (LOL) may help if it’s become stressful. Dogs of any age can easily injure themselves sliding across an uncarpeted floor, but an older dog who may be suffering joint pain or be unsteady on their feet can have a hard time getting around. Our kitchen is not carpeted and when Red is jumping around waiting for her food, she does tend to slip so I have to watch her until she gets the bowl in front of her. If you can’t stand the sight of carpeting, try and get some area rugs to give your dog a non slip surface to walk confidently on. Yoga mats work well as do the inter locking foam squares. Another option is a product called ToeGrips which fit over your dog’s nails to help them grip slippery floors. I have no experience with this product, nor do I know anyone who has used them, but I have read positive reviews so it’s worth looking into. Dogs of all ages and abilities need some form of exercise, the type and frequency will of course depend on the individual dog. 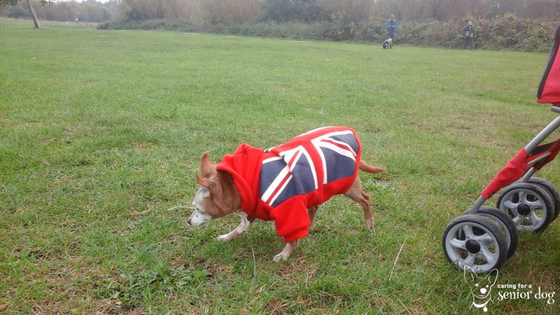 Red goes out several times a day, sometimes just for a quick pee, but about four times a day for a walk. She walks well but I keep each outing to about 10 minutes or so. If I join my husband when he takes our other dog Jack out, or we take a day trip, I have a stroller I use for her. She walks for awhile, then rides the rest of the way. The bonus is there’s room for Jack if he gets tired, needs a break, or for safety in large crowds. If any of you have a dog with mobility issues, exercise is still important although I know it can be challenging. A sling or harness can offer your dog the extra support to help get him moving. Don’t forget all the treatment options available as well! In addition to physical exercise, all dogs need mental stimulation. Keeping the brain active staves off boredom and behaviour problems, and can help with the effects of doggie dementia. Interactive puzzle toys, treat dispensing toys, Kongs and games are all great ways to provide mental stimulation. As our dogs age we’re always looking for ways to ensure their comfort. Well, now you know what I do for Red and I hope you have found my tips helpful. What types of things do you do for your dog? Sharing helps others so leave a comment below, or on my Facebook page. I would like to invite you to join Senior Dog Care Club , my Facebook group for senior dog parents. There you will find lots of helpful tips and advice, a place to ask questions and share experiences. I look forward to welcoming you. 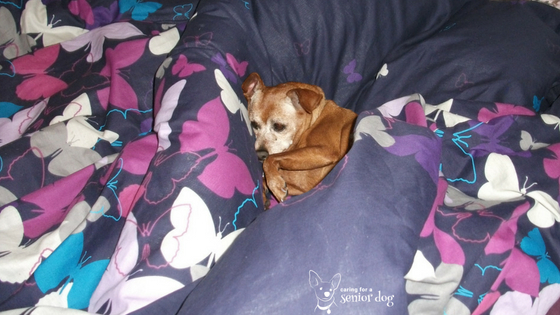 These are all great ways to keep an older dog comfortable! I especially like that you included a photo of a dog in a dog stroller. The first time I saw one “in the wild,” I thought it looked kind of silly. But then I spoke to the woman pushing the stroller and she told me that her dog was very old and couldn’t walk for a very long time, but she still needed fresh air and a bit of exercise. Now I see why dog strollers are useful. I recently bought my dog a special orthopedic dog bed with memory foam. She’s not quite a senior yet, but she does find it comfortable, and I’m sure she’ll appreciate it once she needs it! Hi Samantha, I appreciate you taking the time to comment. That’s my dog in the stroller. I sometimes feel silly, especially if I take her on the bus, but my husband keeps reminding me that it’s great for everyone to see it, and maybe they’ll learn to be more compassionate towards senior dogs, or maybe even realise they could use one for their dog. Lately I’ve been hearing a lot of people tell me what a great idea it is, and they’re going to consider getting one. You certainly don’t need to be older, to appreciate a nice memory foam bed. Sounds so comfy. This is a great article! I have two dogs and one of them is starting to show some signs of age. we definitely work to keep her comfortable and as healthy as we can. Hi Raphael, Nice to hear from you, and thanks, I’m glad you found it helpful. We love our dogs so much, any tips we can get to keep them healthy and happy, for as long as possible, are always welcome. Enjoy your dogs!! Such a great idea for a website and a post! I have had a few senior dogs in my time and it’s always sad when they start to lose their sight. Our German shepherd is currently completely deaf and her hind legs have started to give in, possibly slightly early due to a car accident years ago. Fortunately she is not yet in pain and still very protective over my 2 year old daughter. i agree with you that comfort and diet is a key part in a dog’s health. You can see almost immediately see how different food brands affect an animal’s coat. I can only imagine what effects are happening internally if the external are so noticeable. Hi Marc, Thanks so much for taking the time to reply, and glad you like the site. I have a soft spot for senior dogs, and wanted to do what I could to help others who share their lives with seniors. I recently wrote about hearing loss in dogs. Have you been teaching her signs? When training my other dog I somehow naturally added hand signals to the cues, so now I don’t have to say much, just use a sign. It will come in handy for later in life. My dog’s definition of comfort has certainly changed these past few month, and is happiest when snuggled up in a comforter. I wish you many more years with your Shepherd. Thank you for your response and very wise words. Unfortunately it looks like Tesse will not be around for much longer. She is not in pain, but took a turn for the worst last night. She is now barely walking or eating at all. We are trying to keep her as comfortable as possible, but at 14 years old, we may have to look at the humane option if things do not change by the morning. My little girl is still too young to understand, but you can see the toll it is having on the family. As far as the signs go, we use to show our dogs and I have to agree, Signs often work better than language as dogs react to the tone of a person’s voice and your tone/mood can have a negative impact on the dog’s reaction to commands. Keep up the great work. You have an awesome website here! Thank you Emily, kind of you to say. Red is hilarious – nothing funnier then watching her organise her bed, then wrap herself up in her blanket. These days I keep the heating on for her where she sleeps. True – all dogs are different, yet their needs are the same. I wish my husband and I had thought of taking out stock in the pee pad company. We would have opened our Retirement Home for Animals by now. oh I would love to see Red organizing her bed and blanket! I can picture it! 🙂 Dogs are creatures of habit and some rituals allow them to find comfort. Just like humans. We all do it at times. I used to know someone who used those pee pads too. When I lived back east, the winters were just brutallll! So not having to go outside when it was freezing cold was a big incentive! Hi Emily, it is cute believe me!! I would be lost without them. No dog I get has a clue of what it means to wait until they go outside – sad really. I took her to visit my family in Toronto a couple of years ago, in January and she was not happy. She’s a Florida girl, and it was a nightmare trying to get her to go out in the snow. I tried putting booties on her, but she wouldn’t have it, I finally bought the wax you put on the bottom of their paws to protect against the salt. Imagine what that was like, 8x a day! I’d be there now but she couldn’t tolerate it. It is so cute that Red wrapped her red blanket. It clearly shows that she knows what she wants. She is a fighter. The dog stroller is interesting. I haven’t seen one before. It is a brilliant investment indeed because it is really helpful. Hi Stella, So nice to hear from you. It really is hilarious watching her wrap herself up. She wears a sweater most of the time, yet knows when she needs added warmth. The stroller really is such a help. Although she’s a small dog, she gets heavy quite quickly if I have to walk far with her. Now I throw her in the stroller (not literally, but you have to say that nowadays!!) and I can take her on the bus, or long walks so I can get some exercise. They really are a marvellous invention. Keeping an older dog comfortable is the key. Age will always catch up with them. Monitoring there changing behaviors is helpful. Thank you for your good advice. Hi Ronn, Appreciate you taking the time to comment. Sadly none of us can outrun it! 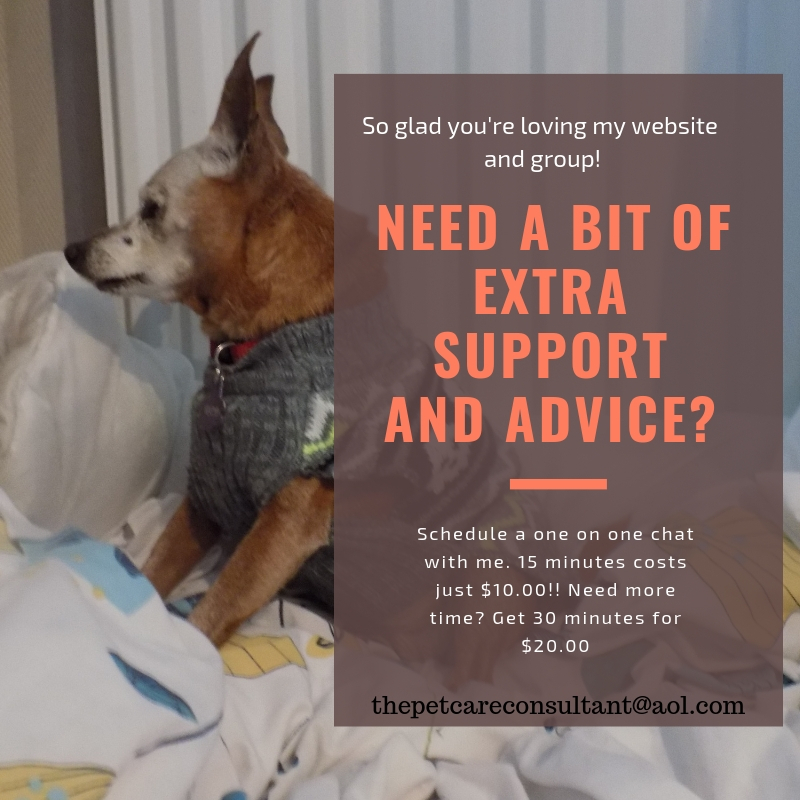 Glad you liked the advice – I’m doing my best to share my experiences, and as much helpful information as I can about ways to care for our senior dogs. first off let me say that I really respect what you’re doing, making sure people are well informed about how to keep an older dog comfortable. I am a total dog lover, have been brought up with dogs, and have seen the struggle and pain older dogs face. It’s admirable that you have put together this complete list of things to remember and ensure for your dog to stay content in their old age. I have a 7 year old German Shepherd, also adopted, also big problem with his eyes among many behavioral issues, but there is no love like that of a dog towards their owner and vice versa, thank you so much for writing about helping them! Hi Eva, thank you for your kind words and beautiful comment. I always love to hear when someone’s pet is adopted, and not bought from some puppy mill. If I can help you with any of his behaviour issues, or anything else, please feel free to contact me any time. Hi Sienna, Thanks for taking the time to comment. I was a cat person long before I had dogs. I got to the point where I had a group of 5, and whenever I moved, they all came with me. My last one died of cancer last December. I do hope to get another cat, I miss having one (or more!!) around. Its very apparent that you are passionate about dogs and the best care for them. Red is very lucky to have you as adoptive human’s. I had adopted an elderly cat with aging problems as well. She didn’t have them when we adopted her, but a few years later it became apparent how old she was. I found it very rewarding to know that what I was doing for her helped her be more comfortable. She lived for 4 more year after that. Hi Debra, thank you for saying that. I’m so glad to you hear you adopted an older pet, how wonderful you had the compassion to do that as sadly most don’t. It is very rewarding knowing how much joy and care you’re bringing to a homeless animal, and I’m sure it’s because of that care your cat got to live so much longer. Really great article that you posted here. It’s very important to take care of its own dog no matter the age. I think you really nailed it by adding the “Exercise your dog” part. It’s often forgotten but it’s very important for a dog to keep exercising. Hi Matt, thank you I’m so glad you liked the article. You’re right about people neglecting older dogs (cats, people…). They assume because they sleep more and may have some trouble getting around, they don’t need to get out there and take even a short walk, see the world. How nice that you share your life with dogs, and good to hear the exercise is doing some good. First off I think your dog looks beautiful! But is there anything you can do early on to prevent using a lot of medication when they get older? Plus, those dog strollers look fancy… They can walk for a bit then get back on the stroller when they are tired! Great site, my dog is still fairly young but it’s important to stay on top of these kinds of things early. Hi Matt, thank you for the comment. Cute yes, but a handful these days!! I really don’t like the amount of medication she’s on at the moment, but because of where I live, I can’t get to a holistic vet, so I make sure I use supplements when I can. I believe that either seeing a vet that is familiar with alternative therapies, or a fully qualified, professionally trained holistic vet is a great way to keep them off as much medication as possible. I don’t believe that medication can be avoided 100% of the time (I’m sure many will disagree with that) but with alternative therapies (like in humans), the focus is on the entire animal and using remedies, homeopathy, supplements to keep them “in balance” is a better path to take. Hi Hindy. I enjoyed reading this post. I shared it with my roommate who helps me take care of our dogs. We are considering the pee pads at night and that K/d dog food. We’re wondering how long it would take our dog, Baby, to figure out she doesn’t have to wake anyone up and can go on the pads. Second, is the K/d dog food and expensive and where do you purchase it? Thank you. Hi Rawl, glad you enjoyed this post. If Baby has an accident in the house, does she give off signs that she’s about to pee? Circling, wandering… If she does and you know it’s about to happen, put her on a pee pad then give her a treat, something that she doesn’t usually get that she loves. She should soon associate using them with something good. I don’t recall if you mentioned if Baby has kidney issues. Has your vet recommended it? It’s a prescription diet that is available through your vet or online. Online retailers used to require a prescription, now they just ask you to tick off a box saying you understand that it’s for kidney disease… It’s more expensive than your basic supermarket food, but not outrageous. In my experience it’s significantly cheaper online, I just compare different sites. She does. She jumps around like a child learning to potty train. Thanks for the help. All I remember with both our labradors when they got old is that they struggled with arthritis pain so we regularly gave them medication for that. The other problem we had in winter is that we would put them to sleep at night on their beanbag beds (bought specially for their needs) and if they got up at night they wouldn’t be able to find their way back due to being mostly blind… and then would fall asleep on the cold tiled floor. This was a big problem because it would almost freeze their joints up and they couldn’t stand up in the morning! Oh poor babies! I keep a few beds around so Red doesn’t have far to go but sometimes she also ends up on the floor. I am planning to get a dog for my girls in a little while and we are going to choose one from a shelter, even though not a senior dog, at least we will be able to give one a home. Hi Vivia, actually her eyes were bulging out of her head because of Glaucoma, not being overweight. It was all down to neglect by whoever she lived with before we took her home. About 4 million dogs and cats are killed each year in shelters in the U.S. I’m so glad to hear you’ll be giving a homeless dog a chance. That’s wonderful. I don’t know if you’ve had a dog before, but if I can help you with any training tips, or get you started, please don’t hesitate to ask. That is so sad, I really had no idea that so many animals are put down each year. I am originally from Jamaica and we have many strays there. My brother-in-law owns a really good vet clinic so the family tries to help out where we can, and find homes for some of them. We have helped get a few into really good homes, and my mother has taken many of the older dogs, being that she has a lot of experience with them. The tropical climate means that they are a bit more comfortable, but we have to be especially careful with heartworm, as a result of all the mosquitoes we have there. I have had a lot of experience with animals and volunteering at a vet clinic throughout my high school years. I think taking care of and being responsible for animals is a great thing to teach my children as well. I will let you know if I have any questions. Thanks for the offer. Hi Vivia, how wonderful to hear about how much your brother in law and family help the strays. You are all incredibly kind souls to do that, as too many just walk by them without a second glance. You’re right about what a great lesson it is to teach children compassion for all living beings. Hindy, you have a heart of gold. I’m sure Red was pretty fried with us humans before she met you. You have restored her faith in humans again. Yes, comforters are so cozy. My wife and I use one in the winter too, so I’m glad that Red can feel cozy and know that somebody cares for her. It’s so important for all living beings to receive love, because inside that dog’s body is a vulnerable person who will respond to love or feel dejected is she’s rejected. Just like us human animals! Good for you, Hindy. Keep up the good work. Hi PJ, that’s very kind of you to say. I don’t know what happened to her before she met us, but she’s incredibly good natured in spite of her past. That’s how we discovered her love of the comforter – my husband was babysitting when I was away, and he couldn’t get her to relax, so he put her on the bed, she made a nest and went to sleep. We all just need a little love don’t we? I can definitely relate to this article. My dog has been with me for almost 12 years (since weened). It kind of makes me sad to see her aging, but she still likes to play. I see that she seems to need to go out more frequently for those bathroom breaks too. China also likes to snuggle in her blankets. Sometimes it’s really funny to watch her trying to unravel the blankets to get them just the right way! I’m wondering more and more just how much longer she is going to be with me since she will soon be 78 in dog years. She is an American Terrier Pit Bull (Brindle) and has always been a marshmallow. She was never trained to be a bully. She is great around all my grands and they love her. So, can you give me any estimate regarding the average life span of this breed? Thanks for sharing this article and I think it is great that you think of the aged population of the dogs. They still need love too. Hi Verna, I’m glad you enjoyed this article. It is definitely hard to watch them get older, but at least they’re still with us. If she’s starting to pee more frequently, have you taken her to the vet? If you’ve noticed an obvious increase, it would be a good idea to let your vet know. There’s nothing cuter than watching them arrange the blankets until they’re just right. Makes me smile every time. I wouldn’t be too concerned about translating dog years to human years. Typically smaller dogs live longer than bigger dogs, but it isn’t a simple formula. It depends on so many factors, it’s all about regular vet checks (at least twice a year or more if there are issues), providing them with good nutrition, physical exercise (type, length of time depending on her physical abilities), and mental stimulation. I have a soft spot for seniors, and only adopt old dogs. This dog is the luckiest dog in the world and all these suggestions and tips are all great. I love the dog stroller. just have a question about taking them out for a walk. is it ok if it’s rainy? I had a friend who never took his old dog out because he was afraid he get sick or something. this dog loved to be out when it was rainy. Thanks Jagulba, I’m lucky too! Of course it’s okay rain won’t hurt them, but the better question to ask is – will they go? A lot of dogs I’ve known look out the window, see it’s raining and won’t budge. My other dog Jack does that – he won’t even get off the couch he hates the rain. I put a raincoat on Red and we go. Glad you enjoy the tips. I love how you covered all the aspects of a dog’s life. There are so many wonderful ideas that many pet parents wouldn’t think of themselves (I know I wouldn’t). I have a cat and she is entering her older age – many of these tips can work for cats too. She is still doing great as if she were a kitten. Hopefully, she will stay that way as long as possible. Thank you Monika! It’s all based on my own experiences of learning how to keep an old dog comfortable, and you’re right these tips can translate into caring for cats as well. Glad to hear yours is doing well, and there is so much we can do to keep them at their best for as long as possible. Good tips! I am dealing with a senior as well, and sometimes the struggles really get to you. Mine seems to be most comfortable sleeping on the kitchen floor. She refuses to use pet beds, blankets or anything like that, and she gets very mad when I put her coat on (I still do when it is cold). I really like the idea of using a small storage container as a bath! I am sooo stealing that idea, lol. Thanks again for the senior tips, and I’m still sad about Red. Thanks Jen and thanks for the condolences! Yes the struggles do get to you, I’ve gone through my fair share of stress that’s for sure. I guess the cold hard surface she finds most comfortable, and yet Red loved nothing more than a huge comforter. My husband used a small recycling bin, hey whatever works!! Perhaps you’d like to join my FB group Senior Dog Care Club if you need any help, support or just a place to vent. It was a learning curve, figuring out what made my old dogs comfortable and of course each one had their own definition of comfort. Red was the love of my love…sorry hubby!! Excellent article and a good reminder to all of us that as our fur kids age, changes need to be made. I have two 14-year old feline siblings and their food, playing etc. needs have changed over the years. All our fur kids deserve the best we can give them at any age. Thanks Anita! I agree it’s important to make adjustments as they age in order to keep them more comfortable. These tips, most of them anyway, are also helpful for cats!! Red is lovely, I’m so sorry she’s passed. My oldest boy will be 10 later this year and senior care is something I’ve started to think about a lot lately. He’s still quite active, which I’m thankful for, but I have been starting to see signs of him aging as well. He’s the love of my life and thinking about loosing him someday breaks my heart, but I’m hoping we have many many years together still. I’m going to do my best to make sure those years are as happy and comfortable as possible for him. Thank you Michelle. On the positive side, because you know him so well and are aware of aging, you will notice subtle signs before a lot of people would. That’s a good thing because you can deal with issues quickly when they’re usually easy to tackle, rather than waiting for very obvious problems that may be more challenging to treat or manage. Thank you Ruth. I agree with you, it’s a good idea to research at different stages to see what else we can do. Wise to put the rugs down and it’s nice Layla can snuggle when she wants, and jump off because it’s low enough. My current dog – and my first dog as an adult – is now in her senior years. Although she doesn’t know it. I am watching for signs of old age so I can help her as soon as possible. Well, signs other than the gray on her snout. Hopefully some of my tips will help!! So sorry to hear about Red. I adopted my dog when he was about 7 and didn’t think of him as an older dog because he was (and is) so high energy. 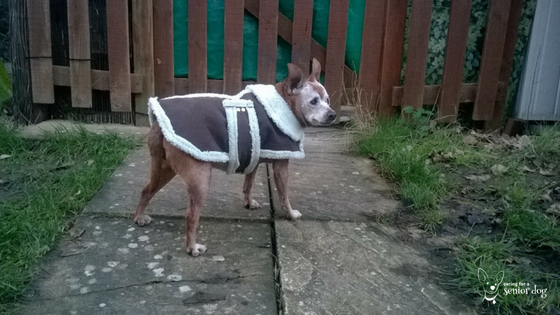 He’s about 13 now and is on prescription diet and some pain pills for joints but still running like mad. He gets around with me too. That’s wonderful Sherri and something I believe more people need to hear. Just because the date on the calendar says a dog is a certain age does not automatically mean his life will be spent sleeping. Knowing there are plenty of high energy older dogs may get people thinking differently and even consider adopting them. I enjoyed seeing the photos of Red again! I think I read this post in the past but always a good reminder. I am glad you mentioned the importance of mental stimulation. I think sometimes people forget this with older dogs, but so very important! I originally wrote this post 3 years ago but revamped it a bit to add some things I’ve learned. Sadly mental stimulation isn’t something a lot of dog parents are aware of the need for at any age. Certainly not anyone I know! I absolutely love that first photo of Red, she was just the sweetest girl. Thank you for sharing all the things you did to keep her as healthy and comfortable as possible. Thanks Cathy. With all that moving around she did it wasn’t always to get a good picture, but when I did she was very photogenic. I hope my tips help, and they mostly work for cats as well. I’m sorry for your loss of Red. 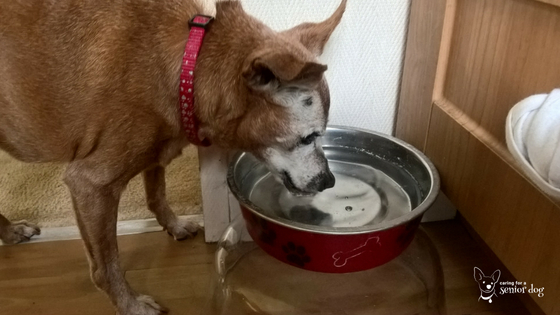 The commitment to senior pets is always be ready for anything I feel because it seems like that there’s always to adapt too. A new health issue, or physical issue. Like your stroller – Red still got out for air and potty but didn’t have to do more than she could handle. Thank you Holly. I only adopt old dogs so a challenge is to be expected, but with each dog comes a different set so I’ve learned a lot. That stroller was the best purchase I’ve ever made. She walked when she wanted, and we didn’t have to carry her around all day like we used to. Even a 9lb dog can get heavy. I haven’t made any modifications for Mr. N yet as he doesn’t need them. I did start giving him a joint supplement though. We recently switched to hard floors and put rugs all about the house as he tends to slip otherwise. The joint supplement is a good idea, I’m thinking of doing the same. He must be so much more comfortable on carpeting, it’s so easy to slip otherwise isn’t it. I did the math a few months back & realized that our oldest dog is now “technically” a senior dog. he’s not showing any signs yet, but I’m being proactive and adding a few supplements. I bookmarked this post for when Darwin needs tis important info! Thanks for this! To me age is a number on a calendar, I suppose that’s how I’m choosing to remain in denial about my own age!! Glad to hear Darwin is doing well, and you’re right to start adding supplements now. As a matter of fact today I mentioned to my husband I should probably start thinking of what I could add to help our dog Jack. We certainly employed many things and techniques with Jasmine. Starting with plastering floors with rugs, ToeGrips, ramps … With our new house, we’re already taken certain measures when building it, such as long-platform low steps. Jasmine is a lucky girl to be with you, and building a house with her in mind is incredible. I’m so sorry for your loss. It’s so difficult. I lost Keira in Jan and I’m still so wracked with grief, I miss her so much. I hope it’s OK that I share your post on my private FB group- Senior Dog’s Around The World? I’m sorry for you as well Maureen, they do seem to take a piece of our heart with them. Of course and thank you for sharing it. I’m so sorry to hear about Red. At least you had 8 good years together. I have also used egg crate foam and doubled up the dog beds to make them extra soft, which the senior dog loves. I had used diapers when I had a dog leak at night from medications and they worked great – get the washable kind and plenty of them. I have not used pee pads yet an hope I do not have to. Buffy is also blind, so she would have a hard time finding them especially since I’m not sure she can smell that well either. Thank you Sandy. That’s the longest I’ve ever had a dog, because I adopt them when they’re old I sometimes only have them a few months. I never wanted to put diapers on Red and she was blind as well so I covered the entire floor with pee pads. Not the prettiest but when her kidneys started failing no matter how many times I took her out it was never enough. 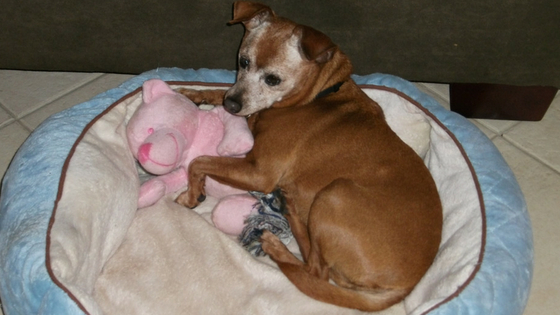 These are great tips about keeping senior dogs comfortable. I agree that it is hard to choose what type of diet is best for your dog because of all of the information out there. I think we just end up doing what we feel is best for our dogs and that is what matters. I think you’re right. We take our dog’s health into consideration, any restrictions they may or may not have, do the research and choose what seems best for our dogs. What works for one won’t necessarily be right for another. Great article! Luckily my senior pup doesn’t have many of these issues yet, but I want to be prepared to help make her comfortable when she does. Thanks Katie!! I wish I had known everything ahead of time, as we all do, rather than learning as I went but we do the best we can. I just hope these tips help others. Thank you Dorothy and I know how much Gibson has inspired you as well. I did lose my muse and haven’t been able to write on my blog for several weeks, but I’m trying to get back into it now. Thanks for sharing, I hope it helps others. I’m sure they’re happier at their own pace, enjoying their lives, just don’t let them see a calendar. It works for me so I’m happy in my state of denial about my age. RIP sweet Red. Oh I can relate to many of the things you mentioned when keeping your dog comfortable even though I only had cats. 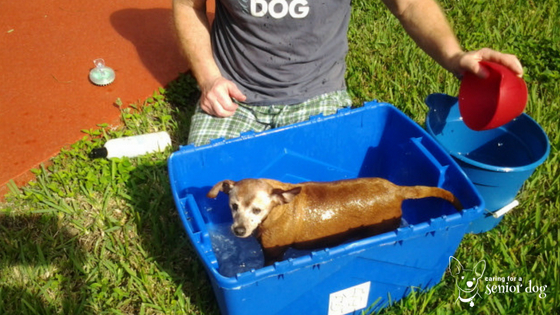 I also, dealt with many of the same issues like making sure they are bathed and groomed especially when they end up having accidents or raised water bowls because it’s easier for them or keeping them warm and comfortable. I must admit, I so miss that the most…snuggling with them in bed. Not only comforts us but them too. These are all wonderful pieces of advice you shared to keep an older pet comfortable. This advice definitely works for cats as well. It sounds like you might be needing another furry friend! It’s been a long time since I’ve had a senior pet. You’ve offered a lot of great advice.